﻿ Marianne Home Inn, Palawan | FROM $17 - SAVE ON AGODA! Have a question for Marianne Home Inn? "Our room was clean, bathroom was clean and has hot and cold shower and the staffs are all accommodating." "Very good hotel for the price, services and location." "Really loved the friendly staff." 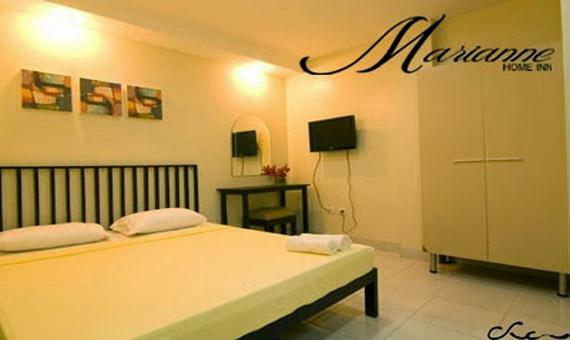 Well-positioned in Puerto Princesa, Marianne Home Inn is the ideal point of departure for your excursions in Palawan. Only 1.0 km away, this 2-star hotel can be easily accessed from the airport. A haven of rest and relaxation, the hotel will offer total renewal just steps away from the city's numerous attractions such as Palawan Museum, Rizal avenue, Mendoza Park. Marianne Home Inn offers impeccable service and all the essential amenities to invigorate travelers. A selection of top-class facilities such as 24-hour room service, free Wi-Fi in all rooms, Wi-Fi in public areas, car park, room service can be enjoyed at the hotel. The hotel features 17 beautifully appointed guest rooms, many of which include television LCD/plasma screen, separate living room, internet access – wireless, internet access – wireless (complimentary), non smoking rooms. The hotel offers fantastic facilities, including massage, to help you unwind after an action-packed day in the city. Discover an engaging blend of professional service and a wide array of features at Marianne Home Inn. "We had a pleasant 2 nights stay." The place was dirty, had bugs, nothing at all like the pictures. If on a tight budget it’ll do. The location was great, but for 100peso’s you can get anywhere. I moved hotels and payed a little more and had a free breakfast, poolside, coffee, tea, it was clean if your cheap 60pesos for two to get to the water walk which is a good one off. The staff was nice. . There’s places closer depends what your looking for. The staff had accommodated everything we asked. They even gas is discounts on tours and transfers. We were already at the UR tour when we asked them if the transfer can jus pick us up a long the way to el nido. The thing is our luggage are still in the Inn, they have brought everything and it saves us 4 hours in travel time. Thank you so much! The place is clean, location is near the center of the town, helpful and accomodating staffs (help us on reservations at Ka Lui and arranged van transfers on our last day),good breakfast, clean and spacious room. Our stay is worth every peso! Will be coming back again. We booked this hotel at the last minute so we expected that this hotel will be just mediocre. So we were surprised by their excellent service. We got the beyond what we paid for. The staff answered all my queries and even assisted me on my flight. Stay was good, nothing extraordinary but value for money. Wi-if was fast, breakfast was basic but that's a standard at such places in Philippines. I was pleasantly surprised when I was offered a complimentary lift to airport in air conditioned car! The staffs are accommodating, friendly and the room is clean. Arrangement for free airport pick-up was a breeze. I just needed to confirm via text message before my flight to Puerto Princesa and an instant confirmation was received. We chose this place because of its proximity to the city proper. Baywalk, where you can have barbecue dinner, is just a 5 minute walk. The front desk was very helpful in booking us the day tour to the Underground River. They provided a set meal for breakfast. Try their danggit meal. Going around the city is simple. We simply contracted a tricycle for the whole day. Our fight going back to Manila was at night, they were kind enough to let us stay for a late check out. They even provided the free shuttle to the airport. Best value for money! It is really worth your dough. Moreover, I wonder how these kind of accommodations make money with such low prices. anyways, i would highly recommend this hotel, with its low price and great service plus clean rooms and not to mention the fast internet connection, you can never go wrong choosing this hotel. Receptionists were polite and friendly but one was not too efficient. On the evening of my arrival, I got her to book me a table at the popupar KALUI RESTAURANT for the following evening and she promptly replied that my table had been successfully booked without even calling the restaurant.The following evening, she called to notify me that the restaurant had been fully booked. Why 2 contrasting answers?The management of Marianne Home Inn needs to take note on this inefficient staff member. Nevertheless, the hotel deserves praises in many other aspects. Will stay again if I ever go back to Palawan. the place is walking distance from the market where you can buy some dilis and cashew nuts at an affordable price. likewise, the staff were so accommodating with our needs. they have this slippers for every room where we opt to use outside. you have options where to serve the food, either on the roof deck or on the restaurant near the reception area. the only weak points were food was not that good. the place was cozy and all the staff at the hotel were friendly. unfortunately, my senior citizen parents were placed at the 4th floor. they had a hard time going up and down the stairs. but over all, it was a pleasant hotel to stay in. what fascinates me with marianne home inn is its ambiance. the mood of the interior is homey. the rooms are also not what i expected from what i paid for. the room is more like of a hotel than a hostel if i might add. i give a value for money a big fat 10. the staffs are very accommodation as well; sometimes i see them busy with phone calls however they always tend to your needs with full attention. Thumbs up! There is really nothing bad to say here in Marianne Home Inn. Me and a friend of mine stayed here for 2 nights and I would say my stay is quite extraordinary. I have to start with the Front desk; they literally know it all when it comes to Puerto Princesa. From what places to see, how to book cheap packages for tours and what delectable foods this place has to offer. Since Marianne is near the Wet Market, they recommended for me to go there and I tell you, it was my first time to see and bought some big sized lobsters. You can let them cook the fresh seafoods for a minimal charge. Secondly, The friendly housekeeping staff greeted us with smiles all day and even remembered our first names. The interior and exterior of the building is really nice, furniture and fixtures are also not bad. I like the rooms the most because it was very clean, they even have a flat screen television and a clean private bathroom to add. It is definitely worth the price I paid. There’s also a water dispenser on every floor, so you do not have to buy bottled water whenever you will be having your mid-night snack. Rooms are clean, neat and very affordable. Michelle (front desk) is really nice and very accommodating. Free coffee and hot choco until 9am. Very nice car used for airport transfer. Rooms are very clean and neat, with huge beds. Nice view from room 402. The hotel doesn't have an elevator. Lobby doesn't have an aircon, but have a lot of electric fans. We're glad that they have an air purifier in their lobby cause the dining area is just beside the lobby. Not so clean comfort room in the lobby. Very short ride from/to Rizal Ave, where the bars/restos are. I think I did not make mistake to choose this hotel because the location is not too bad andcle to wait for you outside always with tricycle to wait for you. All employees are so friendly and not to say also with free breakfast and free airport pick up and delivery. sure i will stay there again if i go to palawan. We are a group of 8 person with 3 family. We had 2 standard rooms and 1 family room. We stayed 3 nights totally. The hotel is valuable. It provided breakfast and had airport up. It's location is good too. The room is clean. The staff are helpful and nice. The room is big enough. The environment is quite and we feel safe even walk on the street at night. We will stay there again next time if we go there. i was so surprised for the free picking up from the airport, i didn't know it in advance. the staff said they didn't have my fight number, so they didn't put my name on the paper. next time, i'll write to them if i visit the city again. the price is including free breakfast and coffee, everyone is so nice there. the room is very clear, the price is so good. it's near the public market, the things in the market are very cheap if you can find a place to cook. we met some people from taiwan, and joined them with the a local church philippinos, had lots of fun there. We had a pleasant 2 nights stay. Our room was clean, bathroom was clean and has hot and cold shower and the staffs are all accommodating. 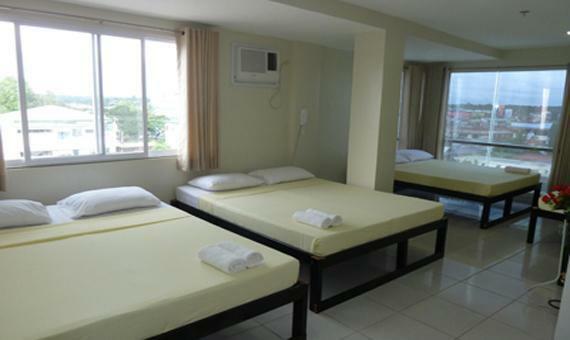 The hotel is very accessible to commercial areas (malls, wet market, fast foods) and very easy to commute. Near tourist spots. My only complain is they dont have an elevator though the bldg was only 4 floors but over all our stay was great. I will definitely come back to this hotel. Stayed here for 4 days and it was memorable. The staff was very welcoming and very helpful when my husband lost his phone during one of our tours. They even helped my husband arranged a surprise on the eve of our anniversary. Highly recommended.